You hear the answers in the order of the questions. In other words, the first answer comes at the start of the recording and the last answer is at the end. As soon as part 2 is over, turn to part 3 and start reading the questions. This is the section with the most text so the more time you can spend reading, the better. Start by reading the question stems and if you have time, go back and start reading the choices. Underline key words. As always, Cambridge use distractors in this section. Be very suspicious of 'exact match' phrases. If option C uses the word 'abundant' and one of the speakers uses the word 'abundant', it's probably not the answer. Eliminate answers that are clearly wrong. Often it's possible to eliminate 3 of the 4 choices, so you can get the answer even if you don't know the meaning of a certain word. There will be words you don't know. You have to develop the skill of guessing what words mean based on context. "Jack regretted eating his girlfriend's chocolate." "Thierry admitted he had cheated to win." "Sally resents being made to learn the piano." Here are all the reporting verbs from just one practice exam: emphasise, agree, support, compare, suggest, criticise. Could it be worth an hour of extra revision on that topic? "I'm frustrated by the poor battery life of my phone. All phones are like this nowadays, so I guess it isn't unexpected. But I hoped it would be better and now I'm a bit disappointed." "I'm completely convinced that everyone will have a robot in the future." "I find that doubtful. It's more likely that only rich people will have the money and the space in their homes." In this listening test, two journalists are talking about their work. Let's start by eliminating some answers. It's definitely not B because Jenny worried it would only be a short-term appointment - the opposite of relieved! And we can cross out D because she says she DID have the nerve and experience to do the job. What about A? Well, she talks about other work she had done, but there's nothing about that work being recognised. In fact, she only got the job because the previous guy had been involved in a scandal. However she got the job, she was desperate to hold onto it, and believed she had the skills to do it. The quality she expresses is determination. Boom! Another point in the listening test! 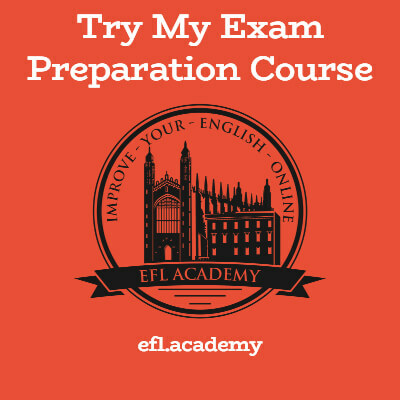 Here's what the same task looks like in the Cambridge English: First (FCE) exam. You have to listen and say why each speaker changed their job. For example, speaker 1 says, "I had to quit my job because I was working 7 days a week and I was close to burnout." Then you write 'E' in box 21. Easy, right? You'll notice that there are more possible answers than questions - there are three you shouldn't use. On the left is Task One: 'Why people changed their jobs'. On the right is Task Two: 'How they feel about their new jobs'. You have to do both Task One and Task Two at the same time. So maybe speaker 1 says, "I had to quit my job because I was working 7 days a week and I was close to burnout. But then I started working as a janitor in a school, cleaning toilets and picking up litter. I can't believe how happy it's made me - now I can go home at 4 o'clock and all the stress I had before is gone." In box 21 you should write 'E', and in box 26 you should write 'C' (delighted by a change in lifestyle). Warning! This is possible: "I recently started working as a janitor in a school, cleaning toilets and picking up litter. I can't believe how happy it's made me - now I can go home at 4 o'clock and all the stress I had before is gone. I had to quit my old job because I was working 7 days a week and I was close to burnout." It's almost exactly the same, but with the answer to Task Two coming before the answer to Task One. Just to keep you on your toes! Some students do Task One when listening the first time and Task Two when the recording is replayed. That works for some people but I don't recommend it. It's not the optimal method - What if someone sneezes or coughs during the replay and you miss a key word or phrase? For most students, I'd advise doing both tasks simultaneously. Note - Cambridge have done research that shows both methods work equally well! You should try both to see which is better for you. Here's what speaker 1 actually says. For Task One (on the left) there are distractors about colleagues (who were familiar, not unfriendly); holiday entitlement (which she got a lot of); and challenge (the job was challenging enough for her). The key phrase is that the job was 'pretty pointless'. That's the same as lacking (i.e. not having) a sense of purpose. Task Two also has distractors. Some students would get confused about the 'early results' because they would think the feeling of calm was at the beginning (whereas actually it was after 6 months). Some students would latch onto 'financially rewarding' and choose F (though the speaker means the opposite). And so on, until we get to D, relieved the initial uncertainty is over. That matches 'after six months of panic, I feel much calmer'. Note that I wouldn't cross out answers A, B, D, etc as shown in this picture - they might be the answers for other speakers. It's just to show the thought process. After part 4 is repeated, you get 5 minutes to copy your answers from the question paper to the answer sheet. If you have any blank spaces at this point, just guess. You never lose points for incorrect answers. Be very, very careful to put your answers in the RIGHT SPACES. It's an easy mistake to make. Imagine you didn't know the answer to the 2nd question on part 4. That's question number 22 in the exam. You might write the answer from question 23 in the space for question 22, and then all the rest of the answers will be in the wrong place! If you think it could never happen to you, remember that's exactly what the captain of the Titanic said. Cambridge have generously provided an online listening test. Sadly, it only works on Firefox or Chrome (browsers) so you'll need to install one of those if you normally use Internet Explorer (why?!) or Safari. I wrote an article about it which explains how to take the test (explaining what the buttons do so you can focus on listening instead of trying to understand the software) - the link to the test is there. Now check out the Speaking Tips; Reading Tips; or Writing Tips.